In regard to handling and application, Dichtomatik X-rings are similar to O-rings, but have a higher stability due to their X structure. 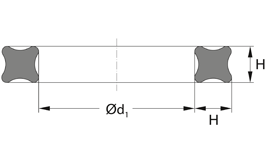 They are double-acting four-lip seals with a practically square cross-section profile. The X-rings achieve their sealing effect when built and pressed into an axial or radial installation space. During operation, the media pressure reinforces the sealing function.